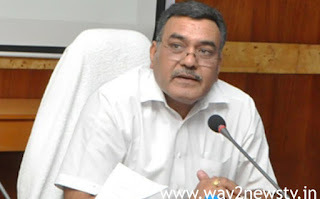 Government Chief Secretary Dinesh Kumar has said that steps are being taken to bring all the government offices under the e-office system by March 31. He held a preliminary meeting on the implementation of e-office and Aadhaar biometric attestation with Integration Officer of the State Government IT Advisor J Satyanarayana at his office in Vellalpudi Secretariat on Thursday. All public offices from the state level to village level by March 31 next year will be made paperless offices. This will facilitate quick fixation of the files in government offices, and it will be very useful for government employees to reduce workloads. It will improve the governance of the government and contribute to more efficient and transparent public services. The e-office system will help to increase accountability among employees. State level headquarters, along with the state secretariat, have also brought district offices under e-offices in some districts, and the biometric system has also been implemented. CS said that all the offices would be fully undertaken by the e-office and the Aadhaar Integrated Elephant Biometric Attendance Policy would be undertaken.Dinesh Kumar said that all the departments working in the department would be integrated into the Human Resource Management System. He, therefore, ordered all departments to take steps to ensure that the software and hardware needed to fully implement the e-Office system by March 31. State Government IT adviser J Satyanarayana said the process would be held in the week of implementation.